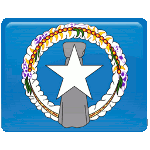 The Commonwealth of the Northern Mariana Islands (CNMI), typically referred to as the Northern Mariana Islands, is an insular area of the United States. They are part of the archipelago of the Mariana Islands located in the northwestern Pacific Ocean. The islands were discovered by Magellan in 1521. In 1565, they became a Spanish colony. In 1899, Spain ceded the Northern Mariana Islands to Germany. After the defeat of Germany in the First World War, the League of Nations awarded the islands of Japan. During the Second World War, the islands were invaded by the United States. When Japan was defeated in the war, they were administered by the US as part of the UN Trust Territory of the Pacific Islands. Following the Northern Mariana Islands status referendum, the islands became a United States commonwealth in 1976. However, the islanders did not have United States citizenship until November 1986. The day US citizenship was conferred on legally qualified residents of the Commonwealth is now celebrated as a public holiday, Citizenship Day.